Once the pollen grains have matured then the wall of the anther will open so that the pollen can be discharged. This is known as dehiscence. The pistil is comprised of an ovary, that which emerges at the base of the flower, and a long style that arises from this bases and ends with a stigma. When a stigma is ripe (or receptive) its surface becomes sticky. Thus the tip of the pistil acts as an adhesive so that when pollen grains from the anther touches the ripe stigma they will stick to it. 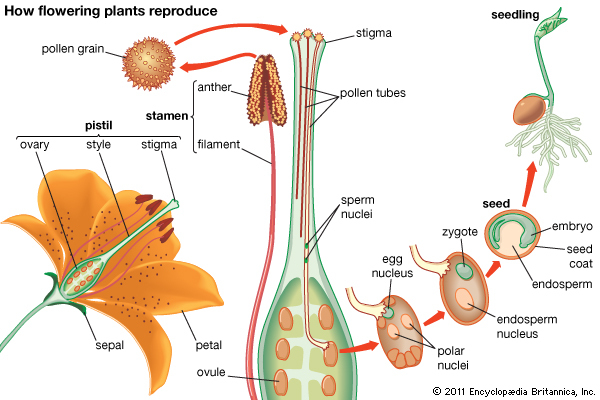 There, in the ovary, the male nuclei from the pollen grain will then fertilize the ovules and overtime leading to the reproduction of a seed. Bees play a significant role in this process. First and foremost, the insect pollinators evolved during the same time as flowering plants, specifically the Cretaceous, thus the relationship between these two groups has been hundreds of millions of years in the making. The majority of plants need some sort of pollinating agent so that pollen can be transferred from one flower’s anther to another stigma (of a different or same plant). The pollinating agent can be done indirectly, such as with wind, gravity, and rain; or directly by multiple different species like bats, birds, and a plethora of insects. Yet, by far, the most important pollinators would be the bees. They are the most effective pollinating agents because they will move from one flower to the next within the same species, as opposed to pollinating different flower species at a time like many other insects do. While a bee is foraging for nectar there is a very likely chance that it will brush against a flower’s anthers and the pollen grains will then transfer to the body hairs of the worker bee. Once she (the worker bee) visits the next flower, the pollen on her body hair will then brush to the stigma of the next flower. Through this process most of the flowering plants are able to continue to regenerate new offspring. Pollination is not only important in wildlife but it also crucial to agriculture. Research has shown that when crop yields were not good then there was insufficient insect pollination. In other cases, some fruits are self-sterile and unless planted near another tree along with having pollinators present, then more fruits will not be produced. In addition to benefiting cultivated plants, research has also shown that biotic pollination benefits the production of non-timber forest products. In turn, this also benefits the multitude of Adivasi (indigenous) communities in the Nilgiri Biosphere Reserve who depend on NTFPs for their livelihoods. This does not even take into account the local surrounding communities who utilize NTFPs from time to time. One study (via the Darwin Initiatives at Keystone) aimed to show to what extent crops and NTFPs benefitted from biotic pollination. The study looked at 213 plant species that were important to the locals – one third was cultivated while the remaining two thirds were NTFPs. The majority of the NTFPs were native to the Nilgiri Biosphere Reserve, whereas most of the cultivated crops were introduced. From the analysis they discovered that 42% of the study NTFPs and 60% of the study crops were directly benefited. They also found that 80% of the study species benefited from biotic pollination, even if they did not directly rely on the pollinators. This study demonstrated that cultivated plants would be more sensitive than forested plants if there was a reduction in the pollination services. In addition, more pollinators were generalists and could readily pollinate new floral species. Furthermore, the honeybees were the most commonly documented pollinators, therefore making bees crucial to the Nilgiri Biosphere Reserve and biodiversity in general. Overall, honeybees as well as other pollinating agents contribute directly to the health, nutrition, and livelihoods of people in the NBR. Pollination is a millions-of-years process that is still in the making. Nonetheless, the effects of deforestation, global climate change, and more are disrupting pollination processes worldwide. Let’s do our part to keep the pollination partnership of honeybees and plants as healthy and sustained as possible! If you would like to contribute to the efforts and research taking place in the Nilgiri, please refer to Keystone Foundation’s website.